Justin Peng, MD earned a B.S. degree in Physiological Science from the University of California at Los Angeles (UCLA), CA in 1998 and his Master of Arts in Medical Sciences at Boston University Graduate Medical Sciences in 2001. In 2005 he received his Medical Degree from Boston University School of Medicine. 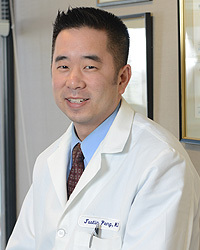 Dr. Peng completed his Internship and Residency in Internal Medicine at Georgetown University Hospital in Washington, DC in 2008. In 2011, he completed his Rheumatology Fellowship at the University of California at Los Angeles, CA. Dr. Peng has a diverse research, employment, and extracurricular background. Between earning his Bachelor’s and Master’s degrees, he was an Emergency Medical Technician (EMT) for UCLA Medical Center. While in Boston, he served as a CityLab Educator, working as a teacher in a biotechnology laboratory designed to teach high school students research techniques. Before completing his fellowship, he worked as a physician at INOVA Urgent Care. His extracurricular activities have included leading a team of U.S. medical students to teach English at Shanghai 2nd Medical University and working in medical missions in Nicaragua. During fellowship, he was also involved in drafting the new ACR guidelines for the management of lupus nephritis. Dr. Peng has co-authored numerous publications in rheumatology and has been the recipient of multiple awards, including the 2016 Marriot Lifetime Achievement Award in the field of Rheumatology. He was also the 2016 Arthritis Foundation’s Walk to Cure Arthritis Medical Honoree and appeared on Good Morning Washington. He is board certified in Internal Medicine and Rheumatology and is a fellow member of the American College of Physicians and the American College of Rheumatology. He has also been recognized as outstanding specialist in Rheumatology in Washingtonian Magazine. His areas of interest also include systemic lupus, rheumatoid arthritis, psoriatic arthritis, osteoarthritis, gout, and myositis. Accepting patients at our Washington D.C. facility. “Both Dr. Peng and Victoria Bown are excellent professionally.” ~ Clare S.